, lord Cullen, an eminent lawyer ind judge in Scotland, was descended from a younger >ranch of the ancient family of the Grants, of Grant, in iat kingdom; his ancestor in a direct line, being sir John Grant, of Grant, who married lady Margaret Stuart, daughter of the earl of Athol. 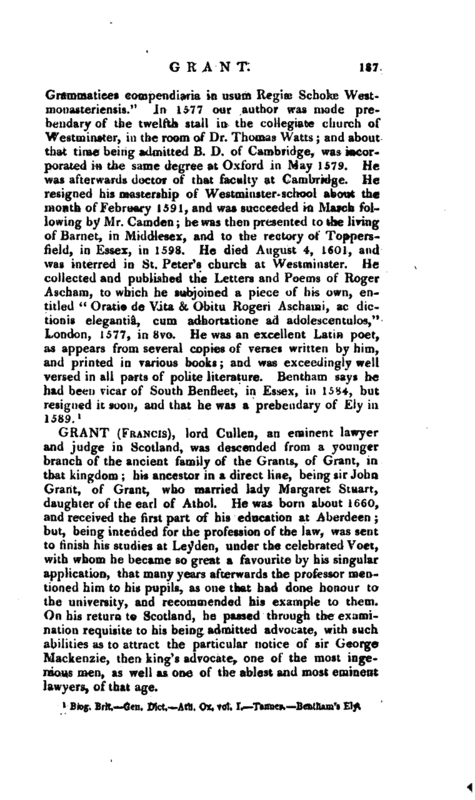 He was born about 1660, and received the first part of his education at Aberdeen; but, being intended for the profession of the law, was sent to finish his studies at Leyden, under the celebrated Voet, with whom he became so great a favourite by his singular application, that many years afterwards the professor mentioned him to his pupils, as one that had done honour to the university, and recommended his example to them. On his return to Scotland, he passed through the examination requisite to his being admitted advocate, with such abilities as to attract the particular notice of sir George Mackenzie, then king’s advocate, one of the most ingenious men, as well as one of the ablest and most eminent lawyers, of that age. | Being-thus 'qualified for practice, he soon got into full employ, by the distinguishing figure which he made at the Revolution in 1688. 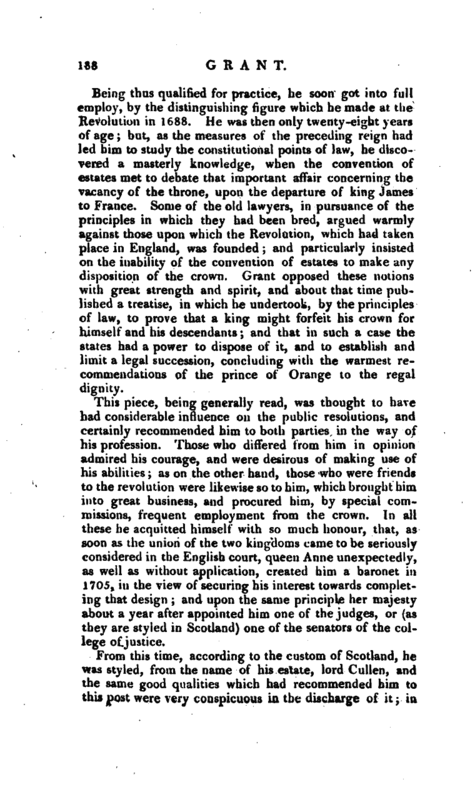 He was then only twenty-eight years of age; but, as the measures of the preceding reign had led him to study the constitutional points of law, he discovered a masterly knowledge, when the convention of estates met to debate that important affair concerning the vacancy of the throne, upon the departure of king James to France. Some of the old lawyers, in pursuance of the principles in which they had been bred, argued warmly against those upon which the Revolution, which had taken place in England, was founded; and particularly insisted on the inability of the convention of estates to make any disposition of the crown. Grant opposed these notions with great strength and spirit, and about that time published a treatise, in which he undertook, by the principles of law, to prove that a king might forfeit his crown for himself and his descendants -, and that in such a case the states had a power to dispose of it, and to establish and limit a legal succession, concluding with the warmest recommendations of the prince of Orange to the regal dignity. This piece, being generally read, was thought to have had considerable influence on the public resolutions, and certainly recommended him to both parties in the way of his profession. 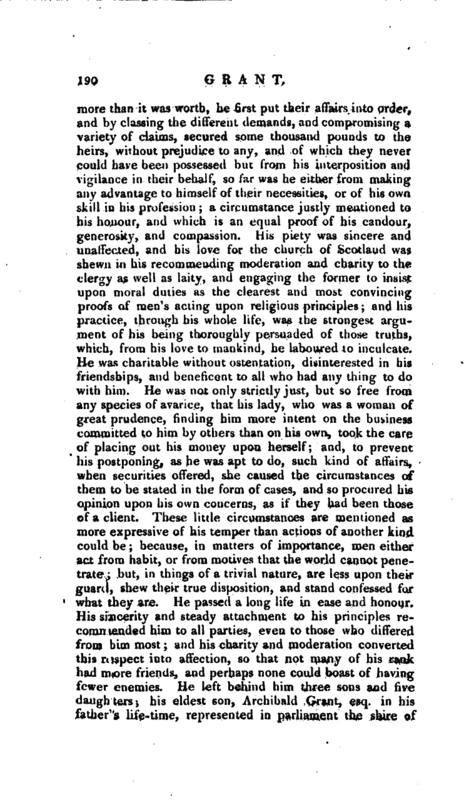 Those who differed from him in opinion admired his courage, and were desirous of making use of his abilities; as on the other hand, those who were friends to the revolution were likewise so to him, which brought him into great business, and procured him, by special commissions, frequent employment from the crown. In all these he acquitted himself with so much honour, that, as soon as the union of the two kingdoms came to be seriously considered in the English court, queen Anne unexpectedly, as well as without application, created him a baronet in 1705, in the view of securing his interest towards completing that design; and upon the same principle her majesty about a year after appointed him one of the judges, or (as they are styled in Scotland) one of the senators of the college of justice. 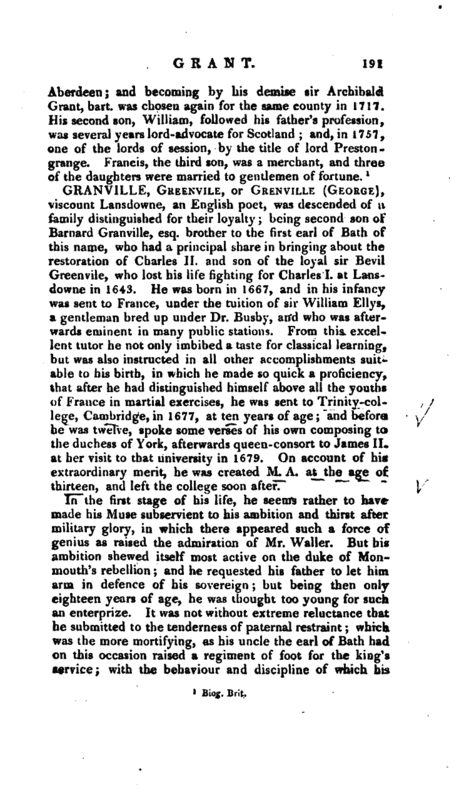 From this time, according to the custom of Scotland, he was styled, from the name of his estate, lord Cullen, and the same good qualities which had recommended him to this post were verj conspicuous in the discharge of it; in | which he continued for twenty years with the highest reputation, when a period was put to his life, hy an illness which lasted but three days; and, though no violent symptoms appeared, yet his physicians clearly discerned that his dissolution was at hand. They acquainted him with their opinion, which he received not only calmly, hut chearfully; declaring that he had followed the dictates of his conscience, and was not afraid of death. He took a tender farewell of his children and friends, recommended to them earnestly a steady and constant attachment to the faith and duty of Christians, and assured them that true religion was the only thing that could bring a man peace at the last. He expired soon after, March 16, 1726, in his sixty-sixth year. 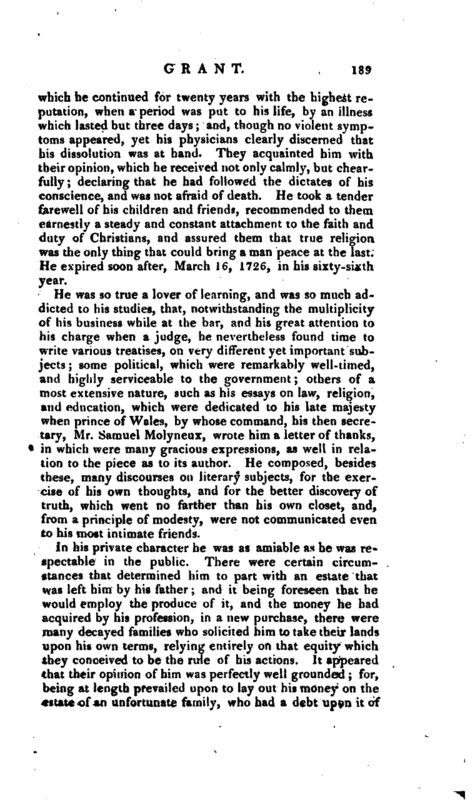 He was so true a lover of learning, and was so much addicted to his studies, that, notwithstanding the multiplicity of his business while at the bar, and his great attention to his charge when a judge, he nevertheless found time to write various treatises, on very different yet important subjects some political, which were remarkably well-timed, and highly serviceable to the government others of a, most extensive nature, such as his essays on law, religion, and education, which were dedicated to his late majesty hen prince of Wales, by whose command, his then secretary, Mr. Samuel Molyneux, wrote him a letter of thanks, in which were many gracious expressions, as well in relation to the piece as to its author. He composed, besides these, many discourses on literary subjects, for the exercise of his own thoughts, and for the better discovery of truth, which went no farther than his own closet, and, from a principle of modesty, were not communicated even to his most intimate friends.